In the early part of the twenty-first century, human resource management (HRM) continues to occupy a strategic role within organizational settings throughout the world. While the field continues to be confronted by recurring problems such as workplace discrimination, new issues continually challenge the field as the world of work continually evolves. This “Perspectives” Section presents an article on a “new” important HRM issue—frequent flyer radiation. In this interesting, well-written and timely article, Dr. Robert Barish, a radiological and health physicist, and Dr. Stephan Dilchert, Assistant Professor of Management at Baruch College, City University of New York, discuss the issue of frequent flyer radiation which has received limited attention in the human resource management literature. The authors argue that employees who fly on a frequent basis on company business should be classified as radiation workers and that work organizations must make sure that they are complying with regulatory requirements with regards to supplying risk education and exposure assessment for this group of workers. Moreover, the authors contend that companies that fail to engage in these two practices may be potentially liable for any radiation-related health problems, especially those with respect to pregnant employees. 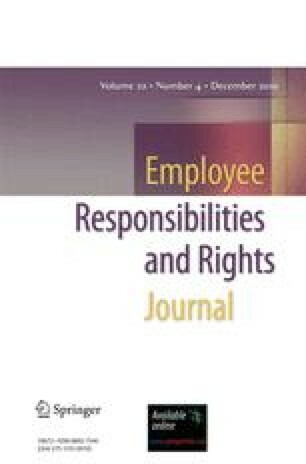 If any of the journal’s readers would like to respond to essays published in the “Perspectives” Section or would like to write on any topics in the field of employee relations, please do not hesitate to contact me with your proposal. I welcome both practitioner-based and scholarly-based articles written from any one of a variety of theoretical perspectives. I hope that you enjoy this article and find it most illuminating.